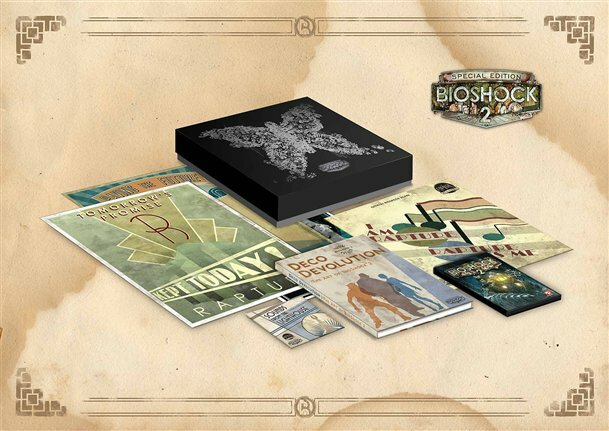 Judging by the official pictures, the Bioshock 2: Special Edition certainly has some darkly divine packaging which features some stylish artwork on the slipcase and cover and looks much sexier than the ‘cutaway’ box released for the first game. Rather than just bunging an action figure into a flimsy box, it seems that 2K Games have produced a more mature, retro styled set this time around, including a vinyl LP of the game’s orchestral score and three ‘vintage’ Rapture advertisement posters. For the UK market, it seems that Play.com have snapped this one up, since as of yet, sketchstone.com have failed to find it listed anywhere else. So whether Play have once again grabbed the UK exclusive remains to be seen, but it is highly likely. It seems, according to 2K Games’ ‘Cult of Rapture’ news that this set is limited to a single production run, though it hasn’t been stated how many units this actually consists of, so in all honesty, you could be seeing it in bargain bins the world over until the end of time, or else going on Ebay for ridiculous sums within a month of release and sell out. At this point it is still up in the air as to whether this set is ‘Special’ or ‘Limited’, but safety conscious collectors will no doubt quietly be adding it to their pre-order list regardless. In all honesty, the special edition looks too damn good to pass up for the standard fare and a couple of extra characters, so if dark and retro appeals to you or the allure of vinyl has pricked your nostalgic nerves, then it would be a top purchase. My most wanted Collectors Edition of 2010 so far, I don’t think much else will come close to it, perhaps the Starcraft 2 one judging by Blizzard’s rep for quality CE’s. It’ll be my first ever LP too..
Sweet jesus. Vinyl! What a brilliant idea, appeal to true collectors who actually have a record player!! I want this. But I can’t afford it. And it might be a disappointing game. First one was so utterly awesome that I am scared this cannot live up to it. I can only afford one special edition this year, and it has to be Bad Company 2.